When you head south on Mattole Road from Ferndale, if you stick with it all the way back to 101 you will enter a portion of the Humboldt Redwoods. When you do… wow. There is a dampened silence amongst the giant trees. It seems like they carry with them a secret that they choose not to share. Are these really the Tolkien Ents? 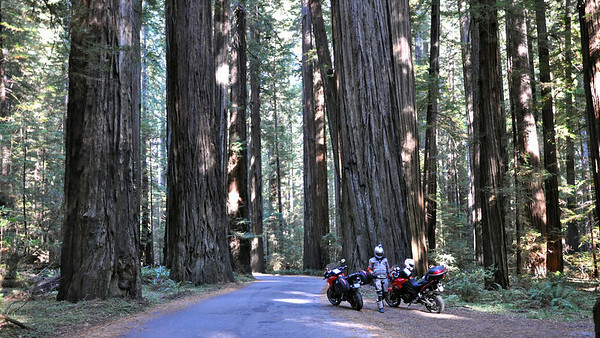 My first big motorcycle trip was to the Redwoods. Your photo brings back fond memories of that week! That forest looks a lot like Endor! That’s an awesome pic Fuzzy….Definitely have to put going there on my to-do list! and I love the comment about the Ents. Watching Treebeard and his posse go postal at Isengard in The Two Towers is one of my all-time favourite LOTR moments! Oh, the memories, thanks for bringing them back. My dad and I were through Jedidiah Smith section this Summer (July ’11) and those trees are AMAZING! We have big trees here in St. Louis, but NOTHING even close to that! The worst part of the trip was that I had to pay attention lest I rear-end the car in front of me. Not sure who was gawking the most! Great times, great photos, I will never forget that trip! I rode The Avenue of the Giants last summer on my Lap Around America and, other than Hiway 1 in Big Sur, it was the most beautiful highway in 31 states and over 12,000 miles! It is truly magnificent! Wow, Mike. That really must’ve been some trip. There is just something about the feeling you get amongst those big trees… incredible.